That was pretty much what I said/thought/felt when I came across this particular recipe. (Of course, on Smitten Kitchen.) I looove coconut. And that is not nearly enough o's to convey how deep my affection really runs for this tropical fruit. Coconut is such a funny creature, and such a difficult one at that. It's a lot of work to crack one open, if you've never tried, and even more work to then dig out the "meat" (Ah! A vegetarian blog that said meat! Sound the alarms!) out once you're in; I tried this once as a young child, with the assistance of my very patient father. I gave up after about five minutes, drank the coconut water that was inside, little that their was, and went off to play. Only years later (many, many years at that) did I actually try the raw insides of a coconut. There was a pure white wedge on top of a fruit salad I bought at a farmer's market in Los Angeles. Expecting the flavor of the sugary-sweet soft shredded stuff, I was surprised when I bit into this very hard, very NOT sweet crunchy piece of .. fruit? It was definitely worlds away from the Almond Joy's and Easter candy I'd consumed before. And BETTER. Fast forward into present day, where I regularly use virgin coconut oil for baking and sautéing, sub coconut milk into baking recipes and morning oatmeal, and sprinkle the (unsweetened) shredded version onto yogurt and cereal. 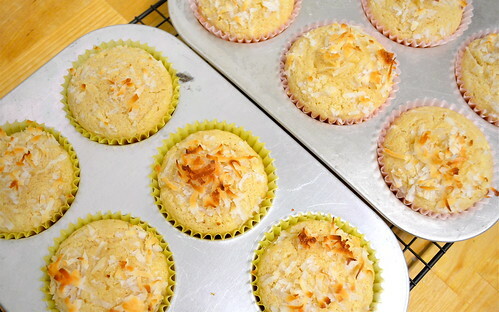 So OF COURSE, you can imagine me instantly jumping on board when I found Deb's recipe for double coconut muffins. As you already know, I decided to up my coconut factor by subbing the Greek yogurt for creamy coconut milk: why double when you can triple? Preheat your oven to 375 degrees. 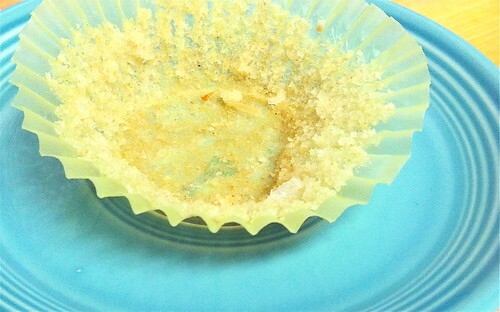 Line 10-12 muffin cups with papers, OR: grease lightly with coconut oil. Would that technically be quadrupling? 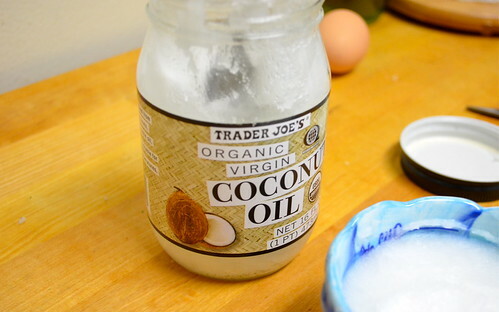 If you've never worked with coconut oil, you'll notice that it's usually a white solid. Unless of course it's mid-July in NJ and you're a boiling hot kitchen with no air conditioning. Otherwise, you'll need to (gently) heat your coconut oil to make it usable. Deb recommends heating on a stovetop. But I went the cheater route and just stuck it in the microwave for about 15 seconds. Suddenly this white paste that you scooped out with a spoon resembles, in fact, an oil. Warning, though: don't heat the oil until it's hot. Just melted is all you need, and the oil itself should still feel cool or barely warm. 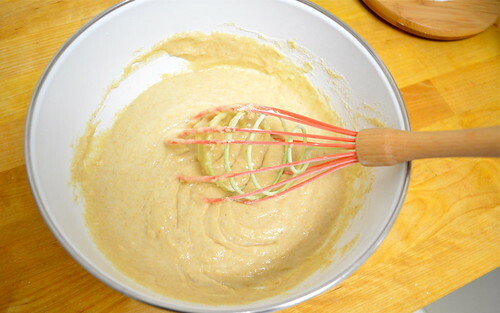 Whisk together your flours, baking soda and salt in a medium-sized bowl. 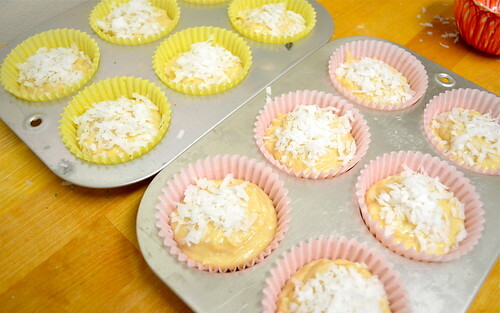 Mix in 1/2 cup of your shredded coconut. In another bowl, whisk together your egg, sugar, coconut oil, coconut milk and vanilla extract. Mix together your wet ingredients with your dry until just combined. 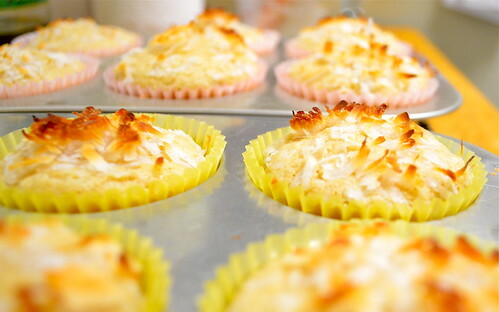 Divide your batter into prepared muffin tins and sprinkle the tops with your remaining 1/4 cup of shredded coconut. Okay. These are AMAZING. They're rich and crumbly and not too sweet. The perfect afternoon snack or breakfast treat, taking me back to that first heavenly piece of real, raw coconut, times three.